Throughout this project, I gained a greater understanding about the Gold King Mine spill and about metal concentration levels that affect aquatic life health. At the beginning of this project, my group and I believed that the Gold King Mine spill damaged the aquatic life health, being that 880,000 pounds of metals flowed into the Animas River. But, since the duration of the Gold King Mine spill only lasted up to twenty-four hours, the high concentrations of the metals did not affect the aquatic life. Also, I learned about the human influences that cause large amounts of metals from entering waterways, such as, agriculture waste and urban runoff. Not only did I learn more about the Gold King Mine spill, but also about which types of fish are in the Animas River and which species of aquatic life are in near by tributaries to the Animas River. For instance, my group and I, were convinced that the Kokanee, Bluegill, Yellow Perch and so on were species in the Animas River, yet we learned that they are in tributaries to the Animas River. Overall, I learned a lot more about aquatic life and their types of habitats they prefer to live in. 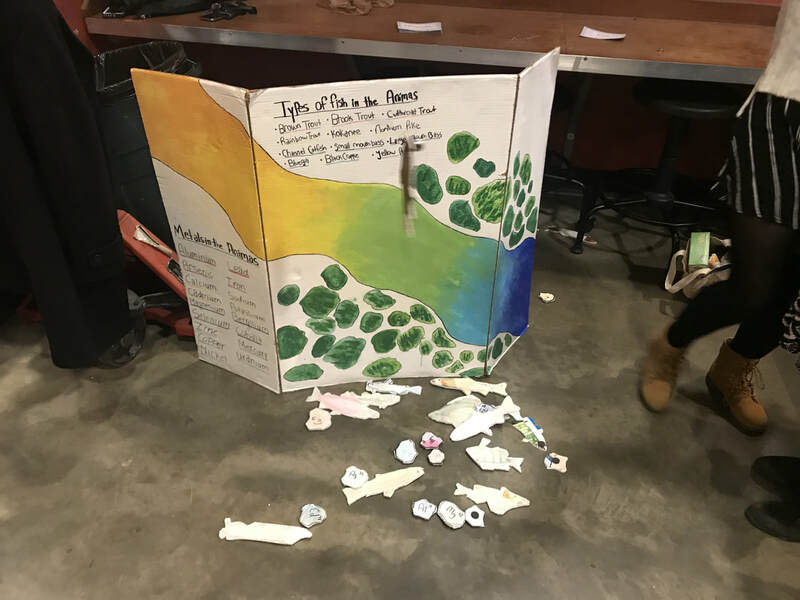 As well as gaining knowledge about the Gold King Mine spill, aquatic life, and metal concentrations, I improved on my creativity skills, time management, and collaboration abilities with creating our exhibit. Being that we only had ten days to complete our project, my peers and I collaborated every day on issues, such as, what we should work on individually and when we should work together. Overall, I think my group used our time proficiently for what we have created. Some skills I acquired through the creativity part was using an exacto knife, working with watercolor pencils, and practicing my hot glue gun abilities. The skill I think I improved on most though was working with my peers because we were together all the time combining our ideas, which can be difficult. At the end I feel like my peers and I were all annoyed, but we persevered through, and are all happy with our outcome. I think the topic of water quality is a very important topic to teach in school and in chemistry, because it’s a real world issue. It allows the students to have an opportunity to explore different concerns with water quality. Also, in chemistry, you can dive into the concepts of pH, turbidity, temperature, conductivity, and stream flow, and see how they relate to water quality investigations. Plus, good water quality is essential to living a healthy life, and when you know more about what the negatives affecting the quality, you’ll be aware and can try to improve it. So when you are of voting age, and there is a question relating to water quality you will have to knowledge of whether or not that’s a good idea, instead of just guessing.